KLEERLOK® There are no products in this category. TRILOBULAR® screw KLEERLOK® is the solution to the assembly on tapped holes contaminated by paint, welding, enamel or other materials which makes installation of the screw more difficult. KLEERLOK® screws combine POWERLOK® screws with a special point designed to scrap material. The special point configuration of KLEERLOK® screws clean the contamination holes, keeping low threading torque and consequently, assuring an ergonomic assembly. 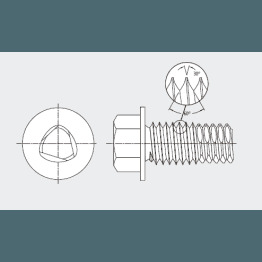 Design specifications for KLEERLOK® screws. KLEERLOK® are produced under special demand to fit your exact requirements. To improve their functionality, KLEERLOK® screws can be produced under different head styles, recess, dimensions and coating configuration. KLEERLOK® screws are specially recommended for the assembly on tapped holes contaminated by paint, welding, enamel or other materials, such as fry pans, storage shelves (painted frames), anodized aluminum parts, etc.